Economic times are hard and many people believe that purchasing a new vehicle is not an option. Every person has a unique story and a unique situation. At Toyota Escondido we understand that and we want you to know that you aren’t going through hard times alone. That is why we have a Special Finance Department, with over 20 years of combined experience our team will work with over 20 different banks to try and help you get into the vehicle you need at a price you can afford. 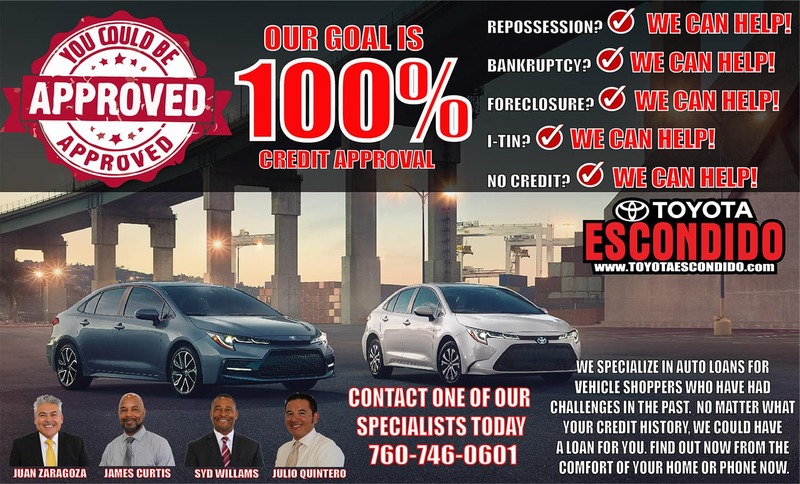 If you think that you cannot purchase a new or used car because of bad credit, or because you have gone through some difficult times, there are still options available to you. Purchasing a vehicle through a company willing to help you out may be just what you need to start repairing your credit and get you on the path to success. Come in to Toyota Escondido and see what we may be able to do to help you out! If you need a car, you owe it to yourself to come in and see how we can help you today.